Collaboration will be key for Vancouver's new mayor as he moves forward with a disparate group of elected officials from across the political spectrum on council — a notable change from the past 10 years, according to analysts . Unlike most large cities in Canada, Vancouver doesn't have a ward system. Instead, politicians form parties. 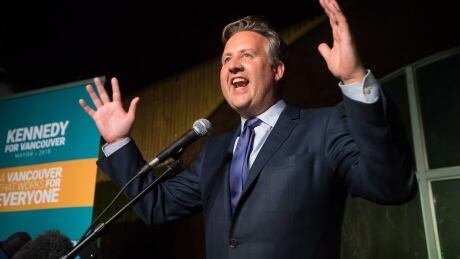 But on Saturday night, Vancouver elected as mayor Kennedy Stewart, a centre-left independent and former NDP MP. "He's not naive about the way that council works," said Gerald Baier, a political science professor at the University of British Columbia. "So he's well aware of the dynamics of council. In fact he might find it refreshing after Parliament." On council, five of the 10 seats were taken by the centre-right Non-Partisan Association (NPA), three by the Green Party, one by the newly-formed centre-left OneCity Party and one by the decidedly left-leaning Coalition of Progressive Electors (COPE). It's a big change from the past decade, during which the city has been led by Mayor Gregor Robertson and his centre-left municipal party, Vision Vancouver. Robertson didn't put himself forward for re-election, and the party didn't win a single seat on council . Vision chose not to run a mayoral candidate after the candidate it chose pulled out of the race four days before nominations were over. "Basically we saw the death of Vision Vancouver last night, and so what replaces it?" Baier said. Stewart will have to collaborate with council members on all sides to form political alliances in ways that Vision didn't have to, Baier says. But Baier and Simon Fraser University political scientist Sanjay Jeram say Stewart was known as an MP who worked well across party lines. "He was known as someone who was respected by other parties," Jeram said. Stewart campaigned alongside the OneCity councillor-elect, Christine Boyle. But he will likely have challenges ahead finding common ground with the right-leaning NPA. Melissa De Genova, a councillor who was re-elected on Saturday, says she's looking forward to working with her four new NPA colleagues on council. As for collaborating with Stewart, De Genova is more hesitant. Especially concerning, she said, is his platform for the election's top issue, housing — Stewart proposed to build 85,000 units of affordable homes. "I just don't see a way to pay for that," De Genova said. Despite the political differences, Baier thinks Stewart might be able to sway some councillors who aren't ideologically aligned with the new mayor. "The thing about parties at the local level is they're not quite as disciplined as they might be at the provincial or federal level," he said. "They probably aren't inclined at the beginning to dig in heels." So long to bickering and partisanship? The need for collaboration is welcome news for the Green Party's Adriane Carr, a councillor who was re-elected with the most votes of anyone Saturday night, and who will soon be joined by two more Greens on council. "One thing we've got to really do is make sure this council actually does operate in a non-hyperpartisan matter," Carr said. "Because the previous council I think really got bogged down in that kind of bickering and partisanship." Carr says the Green Party is ready to work with Stewart. The Greens have never formed firm alliances on council, Carr says, preferring instead to take an issue-by-issue approach to taking sides. Baier points out that Stewart stood arm-in-arm with federal Green Leader Elizabeth May at anti-Trans Mountain pipeline protests when he was the NDP MP for Burnaby. Stewart will likely work closely with the Greens on issues like transportation, Baier says, because they push forward the Green Party's environmental agenda. But the alliance with the Greens won't be as clear as other hot-button issues like housing, Baier warns. "For a lot of voters it's not super clear what you're voting for when you vote Green, at least on local issues," Baier said, noting Carr didn't always support Vision's housing platform, which was similar to Stewart's.